Are you looking to buy your first home or a new home? Most people who buy a home will need a mortgage. Below are some of the most frequently asked mortgage questions. How do I start the mortgage process? Start off by doing some research. Check online how consumers shop for mortgages. Start with a simple search of top mortgage lenders in your city and state. Alternatively, ask friends, family, colleagues, or an experienced realtor for suggestions. What documents do I need to get a mortgage? Initial documentation will usually include your Social Security card, the past two years’ W-2s, and recent pay stubs. What is the difference between a pre-qualification and a pre-approval? This is a good question, as they are very different. A prequalification is simply an estimation of how much the buyer will be able to borrow. A preapproval is a written commitment from the mortgage lender as a buyer. You will usually need this before you start looking at homes. What type of mortgage is best for me? Research the three common mortgages available: the Federal Housing Administration (FHA) mortgage, a conventional mortgage, and veteran administration (VA) loan. Are there mortgage programs for first-home buyers? Yes, check with lenders about the programs they offer for first-time home buyers. Will my interest rate change over time? This depends on the type of mortgage you choose. How much money do I need to take out a mortgage? There are many costs associated with buying a property. Talk to a mortgage consultant to work out how much you can expect to need upfront. How long will it take me to get a mortgage? This varies from lender to lender. However, on average it should take from 30-45 days from application to getting a mortgage financed. 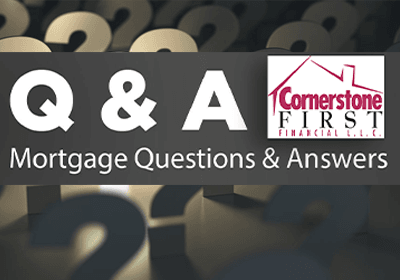 The questions we have covered today are only some of the frequently asked questions about mortgages. It is important to have all your questions answered. Remember: There is no dumb question regarding mortgages. Read the full YOU Magazine article.